Wrekin Hill - or "the Wrekin" - is arguably the most famous landmark in Shropshire, England, and a spiritual touchstone for all those who live in its shadow, informing the mythology of the region since time out of mind and inspiring the Misty Mountain of local writer J.R.R. Tolkein's "The Hobbit". Legend has it that the Wrekin was formed when a giant threatened to flood a nearby town by damming the River Severn with a spade full of earth, but was duped by a clever cobbler who claimed that the town was too distant to be flooded. Seeing the cobbler's bag of shoes, which the cobbler claimed he had personally worn through by walking from the distant town, the giant dropped his spade of earth, creating the Wrekin. 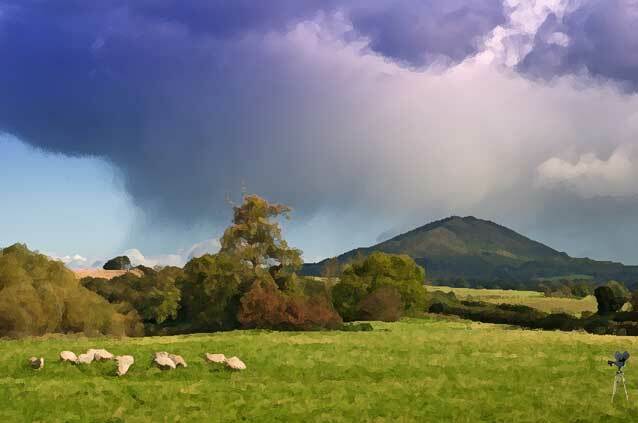 Whatever the truth may be, by the first century A.D., the Wrekin had become home to the Cornovii tribe, who used the hill as a natural fortress against the invading Romans. Since that time, the Wrekin has been a defense against invading Norman armies, and the site of an air raid beacon during World War 2, "The Wrekin Beacon". So monolithic is the hill in the minds of the locals that the toast "To all friends around the Wrekin" is meant as a gesture of universal goodwill.